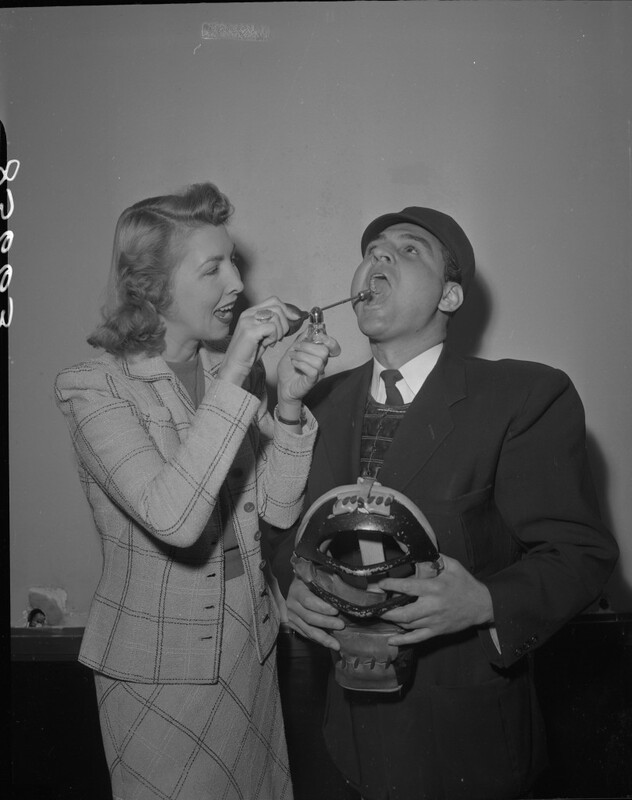 Jeane Hoffman helps Coast League Umpire Cece Carlucci "get his pipes oiled." Los Angeles Times Photographic Archive, Negative 85663. UCLA Library Special Collections. Despite the confidence of her editors that she could get the job done, occasionally they would have to add a short biography of Hoffman before an article to prove to readers that, "She knows the baseball picture there and here thoroughly. "iv And unfortunately, most of her stories did highlight the fact that she was a woman writing about sports (a man would probably not be helping Umpire Cece Carlucci "get his pipes oiled"). Hoffman continued to fight though, and from her extensive covering of baseball, and her honors as a football writer, to becoming the first woman to drive a harness horse at the Hollywood Park racetrack,v Hoffman claimed more success than many of her male colleagues and broke barriers for women in sports journalism. Many people today might not recognize Jeane Hoffman's name, but her legacy lives on in the photographs and stories she wrote for the Los Angeles Times and other publications. Hopefully her career can inspire other young women to follow their dreams, regardless of the obstacles. iii. "Jeane Hoffman Made Member of Grid Writers." Los Angeles Times (1923-Current File). [Los Angeles, CA] 21 Dec 1956: C4.